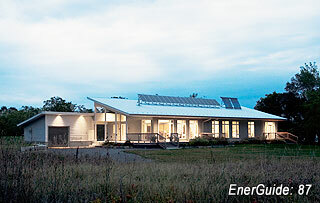 After seven years in practice, we are keen to examine the energy efficiency achievements of our projects. The homes we have designed have varied in size, location and aesthetics, as well as in the sustainable house design strategies we have employed. 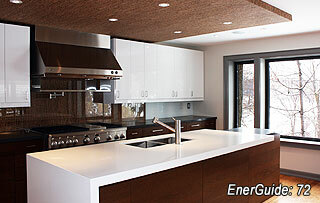 In an effort to demonstrate what we are achieving in each of our projects, and to communicate a clear and consistent picture of where they sit in the wider context of Canadian green home design, we have begun the process of rating each of them with the EnerGuide Rating System. The Office of Energy Efficiency at Natural Resources Canada developed the EnerGuide rating system for use across the country. EnerGuide offers a standardized tool for evaluation that homeowners can use to assess the energy efficiency of their homes as compared to other homes of similar size and in comparable regions. 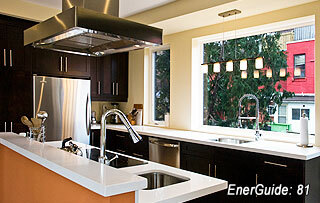 Each rating, prepared by an independent rating expert, is based on an estimate of the home's annual energy use. The estimate is determined by evaluating attributes that include location, size, equipment and systems, insulation, and tests for air tightness. In order to compare a wide range of homes across the country, the rating system uses a standard baseline of operations, occupancy and lifestyle in order to level the playing field when calculating each home's final rating and for comparing the energy efficiency of one house to another. EnerGuide uses a rating scale from zero to 100. 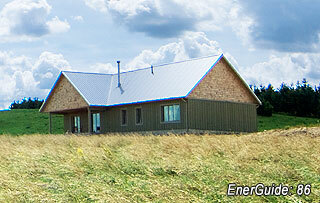 A very low score indicates a home with no insulation, major air leakage and exceptionally high energy consumption. Conversely, a score of 85 and higher indicates the opposite: a home that is well insulated, extremely air tight and well ventilated, and has no need for purchased energy on an annual basis. 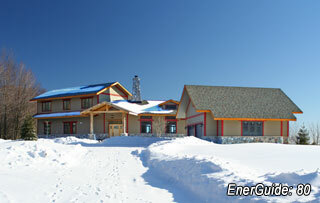 For new homes built to building code standards, a typical EnerGuide rating would be in the range of 65 to 72. A rating of 80 or higher is considered excellent. At lower scores of around 50 to 70, some basic sustainable house design strategies can easily bring up a home's score to a reasonable level, however at higher ratings each extra point is more of a challenge – and an accomplishment – to achieve. To date we have had seven of our projects rated under this system, with an average score of 82, with three new projects projected to score 87 or higher. Our motivation to rate our projects is threefold: first to provide transparency for our clients, second to avoid the possibility of "green washing" or exaggeration, and last to assess our progress on the road toward creating net zero energy homes. 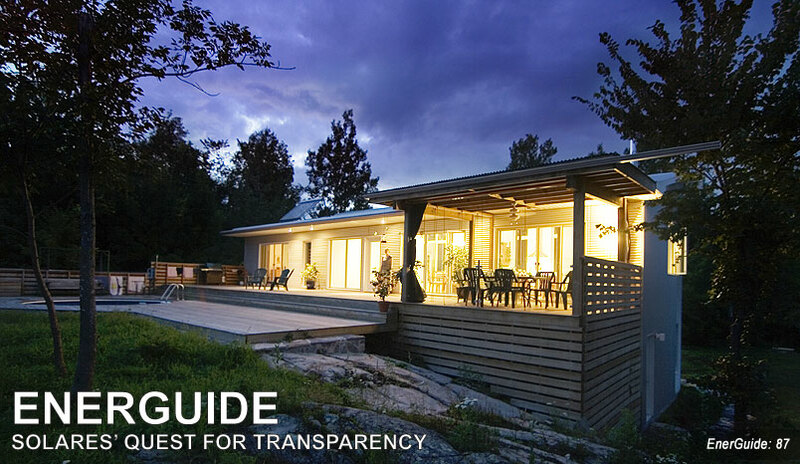 While we do follow up with energy usage reports from our clients for a number of years after a home's completion, the EnerGuide rating offers another means with which we can evaluate our successes and learn from the challenges presented by each set of project circumstances. For instance, factors such as building volume and shape can affect insulation levels and air-tightness, and choices around mechanical systems can impact base energy consumption. We look at all of these factors when working with our clients through such decisions that require the weighing of budget and lifestyle with overall green home design and energy efficiency goals. We will be posting the EnerGuide rating of each project on our website – look for the score at the bottom of each project description. We hope this provides another means of understanding our projects, as well as the motivation and passion we have for green architecture in all our work. Please feel free to get in touch with us if you have any questions about our projects and their energy efficiency ratings.